Needing help with Tax preparation? Click Here! Needing help with tax planning? Click Here! Want to find out more about Ed Lloyd & Associates? Click Here! Tax season is here! As you prepare your business’s taxes, I have some tips to share with you today. First, take a look at your distributions account. Are there items there you can write off? Highlight them to deduct later on once you file. Examine your personal finances. Maybe it’s your numbers in Quickbooks or something you’re keeping handwritten. Keep in mind credit card statements. Did you use personal funds to pay for anything business-related? Keep track of those expenses! Lastly, look at your tax plan. Are there expenses there that followed through? Let us know what they are, so we can identify them and keep your tax bill as low as possible. If you have any tax questions, we’d be happy to help you. Reach out by phone or email today! CloudBOSS empowers you to manage your business with digital dashboard precision on any desktop or mobile device. It’s a secure, cloud-based way to run your small business with the portability and power today’s entrepreneurs need. Additionally, CloudBoss offers paperless workflow, digital approvals and filing systems. At a flat monthly rate, you have access to innovative technology to improve your company. Manage your business the way you’ve always dreamed of! The end of each year serves as a reminder to set new goals and resolutions. But the end of the year is also a reminder that the date of paying yearly taxes is approaching and you need to start preparing for it. Even if the tax season is several months away, it is the time for you to start preparing for it so that you do not miss out any essentials. As a business owner, you play multiple roles. You are the hiring manager, you ensure the smooth functioning of the business and you are the one who form and implement policies. But while handling various responsibilities, if you missed to keep a finger on the accounts and books of your business, then you may face yourself in the real trouble. 1. Keeping your accounts updated in a regular manner is important as it will help you to know the exact financial position of your company so that you can reach to informed decisions. But failing to do so can give you an incorrect picture of your business. We at, Ed Lloyd & Associates PLLC manage your official accounts and books in a timely manner so that you are able to know the financial standing of your business. 2. Our highly skilled, experienced and knowledgeable team of professionals takes time to learn your business processing and then come up great ideas that can help you minimize taxes. We are blessed with the right mindset and experience to oversee money related examinations that allow us to offer our patrons with an accurate documentation of how their organization has performed during various parts of the year. 3. There are various opportunities that may knock your door as you advance towards the end of the year. Therefore, preparing your taxes before the year end can help you obtain those opportunities without compromising with the financial stability of your business. Throughout the entire process of tax planning, we focus on the various options that can reduce your taxes. By trusting the job with us, you can free up your internal resources and utilize them for performing more productive tasks. We believe in 100% customer satisfaction. We analyze all the options that are available to you and ensure your business is on the right track. We have offered our meticulous tax planning and accounting services to a large number of businesses and individuals. Need Tax Planning Assistance? Call Us Right Away! We are always available round the clock to answer your questions and queries that you might have. You may contact us and we will have one of our professional to analyze your business processing and give you the most valuable advice. Give us a call and we would be more than happy to serve you! How Can You Best Prepare for Tax Season? Hello everyone! It's tax time, and we want to help you make the most of what can sometimes be a stressful time of year. 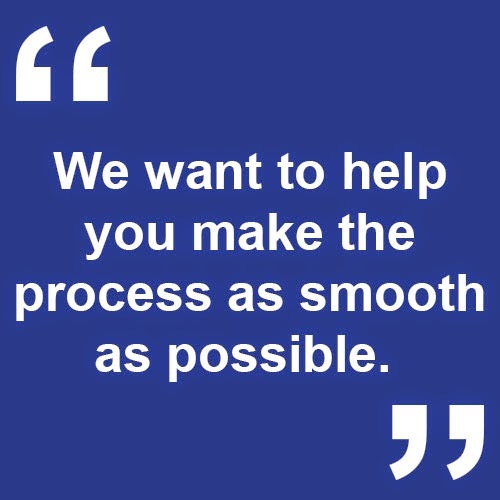 Recently, we sent you some information for your business and individual tax returns, and today we want to help you understand what information we need from you so we can make the process as smooth as possible. We sent you a business information checklist that's simple to fill out. First, make sure you sign your engagement letter. After that, go through the information request and answer the questions as completely as you can so we can accurately prepare your return. There are many things in here that can help you reduce your taxes. If we don't prepare your accounting records for you, we ask that you please provide us with a backup. We have sent you some straightforward instructions on how to get this information to us. We also need a copy of your Form 940 and a copy of the shareholder W-2s, so we have an idea of how large your company's payroll is. Make sure your health insurance is included with the W-2s - if it's not, you will not get the reduction! We also need your December bank statements, loan statements, and any additional information you can share! The checklist we've sent you will tell you what information we need from you, as well as what you can do to help reduce your taxes as much as possible. Like the business tax return, the first thing we need is a signed engagement letter. There are additional forms we need you to complete due to the Affordable Care Act, and it's very important you get them to us. We've streamlined the checklist as much as possible, so that we can get the information we need without being burdensome. If there is information outside of what we ask for, there are places you can go for that as well. Also, if we did prepare the K-1s you're involved with, we will also need those. If you purchased or sold a home this year, we will also need a settlement statement. We request that you please send us any additional information we ask for, as we are simply trying to help you save as much money as possible. If you have any referrals we could help out with, or have any questions about this tax season, don't hesitate to give us a call or shoot us an email. We would love to give you a hand! What Do These 8 Tax Changes Mean for You? Recently, there have been some important changes in tax law I feel you should know about. 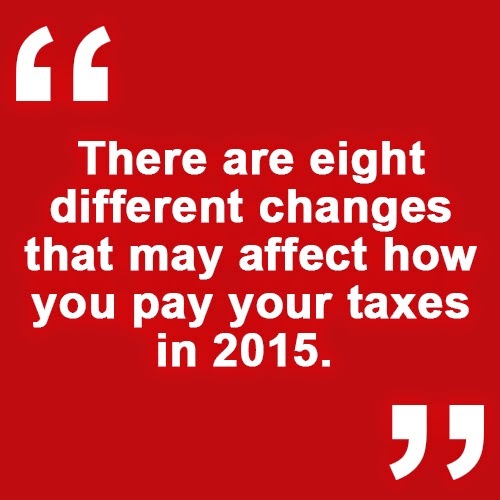 Starting this month, there are eight different changes that may affect how you pay your taxes in 2015. Today, we'll give you a brief rundown of each. Health Insurance Penalty: Part of the Affordable Care Act mandates that all Americans have health insurance or pay a tax penalty as a result. In 2014, the penalty was 1% of your household income, or $95 per person. This year the penalty is 2% of household income, or $325 per person. 401(k) Limit: The limits for 401(k)'s are going up this year. You can now put up to $18,000 in, which is a $500 increase of last year's cap. Make sure you tell your payroll company to adjust your contributions beginning now, so you can save the maximum amount allowable for the year. Catch-up Allowance: For individuals over 50, the catch-up allowance for those over 50 has been increased to $6,000 from the $5,500 cap that was previously in place. Flexible Spending Account Limit: The annual limit on employee contributions to flexible spending accounts is now $2,550 for qualified care expenses. That's up $50 from 2014, so make sure you opt-in for this maximum amount if you take advantage of a healthcare FSA. year, rise to $6,300 for single filers and $12,600 to joint filers. Tax Brackets: Income tax thresholds have again been adjusted up for inflation. The highest tax rate, 39.6%, now applies to single filers making over $413,200 and couples making over $464,850. Both of these figures are up about 1.6% since 2014. IRA Rollovers: Beginning in 2015, you can only make one rollover from an IRA in a 12-month period. This is a little bit tricky because you can still make as many trustee-to-trustee transfers as you like. The IRS is trying to eliminate the practice of taking money, holding it for 60 days, and then putting it into a new account. To protect yourself, limit all rollovers to direct transfers in 2015 if you plan on moving money more than once. AMT Changes: The Alternative Minimum Tax is quite the headache for many Americans. Since certain breaks can significantly reduce your tax bill, the IRS created AMT to set a limit on those benefits and insure a minimum tax burden on everyone. The AMT exemption for 2015 is $53,600 for individuals or $83,400 for joint filers. That's a lot of information to digest at once. If you have any specific questions about these changes, or would like more details about how you can prepare for the new tax year, don't hesitate to give me a call or shoot me a quick email. I would truly love to chat about how you can prepare for the coming year. Ed Lloyd & Associates, PLLC is a full service accounting and business development consulting CPA firm in Charlotte, North Carolina. We specialize in assisting business owners and managers with management advice, direction, and analysis of their business. We do this by providing accounting services, tax services, business valuation, and wealth management. Our team focuses on managing taxes in their proper order. We focus first on tax planning, then on proper tax reporting, and finally tax preparation. You need more than someone coming in at the end of the year to record your tax history over the last year. You need a CPA firm like Ed Lloyd & Associates, who have your long term interests in mind and can help you reduce your income taxes, avoid IRS audits, and increase your wealth.